5 weeks to go!!! Only 5 weeks until the Chattanooga Marathon! I'm excited and a little scared and so happy that I will be able to take a break from running SO much! This week I came up with the most likely scenarios that could keep me from starting the marathon. My husband or one of the "kids" (horses, dogs) could be hurt or sick enough for me not to go on a 2-night trip to Chattanooga. The weather. The temp in TN in early March can be anything from 9° to 75°F. The weather can be anything from gorgeous, clear and sunny, to dealing with the edges of a hurricane . Or tornadoes. Or a 12" snow storm (which will shut down the state for about 3 weeks). Those are all pretty much out of my control, so I'll just hope none of it happens. Now on to the training recap. And I mean rest. I planned to get up early and run 12 miles because the forecast was calling for a lot of rain later in the day. Around 6 AM, I checked my phone and there was a big band of rain right over us, so I turned off my alarm and went back to sleep, expecting to wake up in an hour or so and check again. 4 HOURS later I woke up. I was still really tired and didn't really feel 100%. I had a little bit of vertigo. Not enough to go back to bed, but enough that I was queasy and a little off balance when moving around. So I played on the computer all day and skipped my run completely. 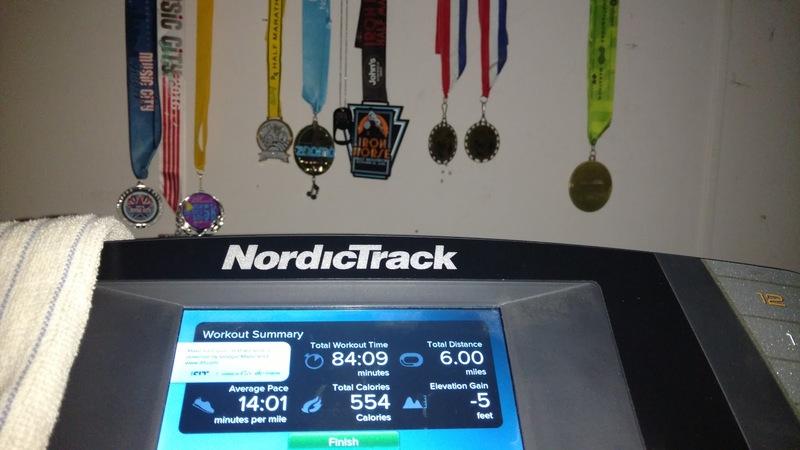 After another good night's sleep, I was feeling better, so after work, I hopped on the treadmill to do a few miles and managed to do the entire 12 mile run I'd skipped on Sunday. Run 1/4 mile @ 12:30 pace 0% incline. Walk 1/4 mile @ 21:26/mi (2.8 mph) 6% incline. This meant I climbed as much as I ran downhill. Just oddly shaped hills! Every mile clocked in within a second of 13:29, so it's a good workout to be able to pick the number of miles I do and still have my average come out correctly. Running in the dark was a little disconcerting. I was afraid I'd fall off the treadmill because I couldn't see the belt! I probably should have turned the lights on in the room, but the light bulb puts a glare on my tablet that I use for reading blogs or watching TV while I run. This was an easy run with run/walk intervals that got 10% longer with each interval. 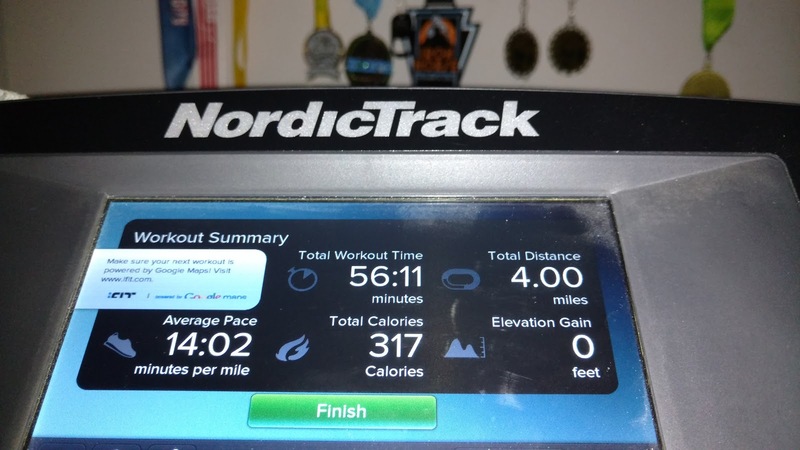 It's become my go-to 4 mile workout, especially when I just don't feel like running. This was a repeat of Tuesday's workout. But it was a horrible run. My legs felt like big blocks of concrete and I couldn't wait for the workout to be done. I toyed with the idea of quitting at mile 2 or 3, but pushed on and made the entire 4. That's one of the really bad mental things about a treadmill. I could stop at any point. My cut through near the parking lot is still under water. This was supposed to be a 10 mile tempo run at around 12:30 per mile. I had mapped out a nice 10 mile loop run from River Park, down almost to Smith Park and then back up Raintree Parkway and into the back of Crockett Park. After Wednesday's horrible 4 mile "easy" run, I was really afraid I wasn't going to be able to do a 10 mile tempo run. I promised myself I could slow down after 6 miles and then finish the run with long run pace or easy paced miles. I could also cut the run down to 9 miles by just running back up the Greenway instead of doing the loop. Once I established my "outs" for a bad run, I started my run. It was about 39°. Sunny and beautiful with a slight breeze. I wore my lululemon Toasty Tech II winter tights, inknburn arm sleeves, purple charged wool half zip shirt, headband, light UA hat, silk glove liners and knit gloves. Took the knit gloves off around mile 3. But everything else stayed in place and zipped up for the entire run. I ran down to the Primm Park bathroom just south of Moore's Lane and took a quick bathroom break. 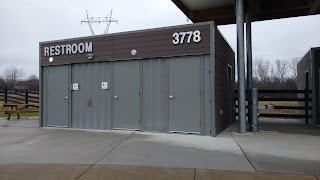 When I got just north of Smith Park, where I was to turn to go to Raintree Parkway, I decided I wanted to refill my water bottle so went ahead and ran to the Smith Park bathrooms. That decision added more than a mile to my run, but was a good decision. I figured I could just have an extra long cool down. 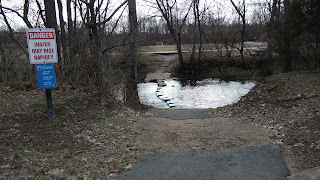 I took a gel just after leaving Smith Park and ran along Raintree Parkway until the Greenway ended at Crockett Road. I crossed Crockett Road and ran along Green Hill Blvd. I was supposed to turn left onto Glenview Drive, but I missed that turn because I thought it was too soon. I ended up turning left on Glen Ridge Drive. Both hook into Navajo Drive, so I wasn't lost. I just added about 3/4 mile to my run. At this point, I was past 10 miles and figured I had a couple more to go. I was still running, though. I had stopped twice for bathroom breaks and had dropped to a walk briefly for a phone call and street crossings. 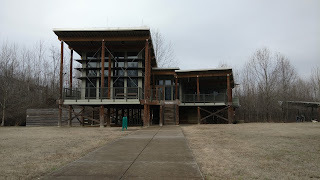 I ran to Chocktaw Trail and then onto Arrowhead Dr. There is a connector trail from Arrowhead Dr into Crockett Park, so I took that and ran straight through to the bathroom by the tennis courts for my 3rd and final break. I refilled my water bottle and took a long drink before heading out for my last mile and a quarter. Quick picture at the finish of my run. My mile paces were a little erratic. My first two miles were spot on, then I slowly sped up for the next 4 miles. My slowest mile was mile 8 which had a good long climb on it and I still managed to do that in 12:41. My last 4 miles were progressively faster with my final mile being run close to my 5k pace of 10:53! For me not thinking I could get through a 10 mile tempo run and then run the 12th mile at my 5k pace was pretty cool. I did have 3 breaks during which I stopped my GPS. All 3 breaks totaled 6 minutes and 50 seconds. Without my breaks, my average pace was 12:10/mi. With breaks, the average was 12:44/mile. Definitely something I'll take. Fuel: Ate grits, american cheese, "sausage" patty about an hour before starting. Ate 2 Clif shot bloks a mile in. I bit my lower lip while trying to eat them. Ugh. Not really sure when I ate the rest, but had the rest of the bloks 2 at a time. And ate a gel around mile 5. Doesn't seem like quite enough fuel, but I was able to rock out the last mile anyway. Definitely pleased with this run. This was another 4 miles on the treadmill. The ease-into-it workout that I did on my other easy days. This run wasn't nearly as bad as my Wednesday run. I just eased into it and got it done. I've been looking for new running capris. I have a pair of lululemon Outrunner 17" capris, but I don't love them. They have big thigh pockets, which is one reason I bought them, but the pockets start low and anything with any weight actually ends up interfering with my knee! So I can only use those pockets for a key or something. There is also mesh on the legs of the lululemon capris. Which is fine, but between the mesh and the weird thigh pockets, multiple seams end up coming together just behind my knee and I've been rubbed pretty bad there if I forget to put on lots of Body Glide. I really like all the waist band pockets. While I'll keep these capris, they're really better suited to shorter runs when I don't need to carry much with me. Having said all that, I ordered 4 items from Athleta. I've never tried any of their stuff before, but Jennifer over at Dashing in Style has done some reviews on some of their stuff, so I went looking to see what I could find. My nearest Athleta store is about an hour away, so I ordered online. I specifically wanted a zipper pocket in the back on the waistband and thigh pockets. I found 4 things to try. I realize now I probably should have taken pics when I tried them on, but I was home alone and didn't think about it. I ordered a Dapple Be Free Knicker in Deep Indigo, Size Small. They were gorgeous! I loved the style. The color was dark, but not black. Muted, but pretty with black panels down the sides of the legs. The fabric was heavy and the length was just below the knee. I liked the feel of them and the way they fit me. Unfortunately, the zippered back pocket was small. I could force my 2015 Moto X Pure/Style phone into it, but it wasn't easy and the pocket really wasn't big enough for that. The thigh pockets are too short for my phone to stand up in and it looked very odd for me to put the phone in sideways. I seriously considered keeping these because I liked them so much other than the pocket configuration. But pockets are a big deal to me. So back they go. I also got Be Free Shorts in Small and Dot Be Free Tight in Medium Petite. I liked the shorts a lot. They came down far enough on my thighs to avoid rubbing issues, but were flattering and comfortable. The tights were just to see the difference in sizing in case size small had turned out to not be flattering on me. The medium was definitely too loose on me, but I did like the petite length. Both the shorts and the tights had the same pocket configuration as the Knickers, so those got packed up to send back. The last pair I had was a pair of Small Petite black Relay 2.0 Capris. After the disappointment of the pockets on the Be Free line, I wasn't hopeful. but I pulled them on and slid my phone easily into the zipper pocket! Yay! The pocket was bigger! I slid my hands into the thigh pockets and they were bigger also! But not so weirdly placed as the lululemon capris I have. These were also flattering on me. Of course, with the thigh pockets loaded with fuel, I look like a weird squirrel getting ready for winter, but that's true of any of the tights with thigh pockets. So all the Be Free stuff is going back, but I kept the Relay 2.0 capris. I wore them on my 4 mile run on Friday with my phone in the back pocket and enough fuel for an 18 mile training run in the thigh pockets. 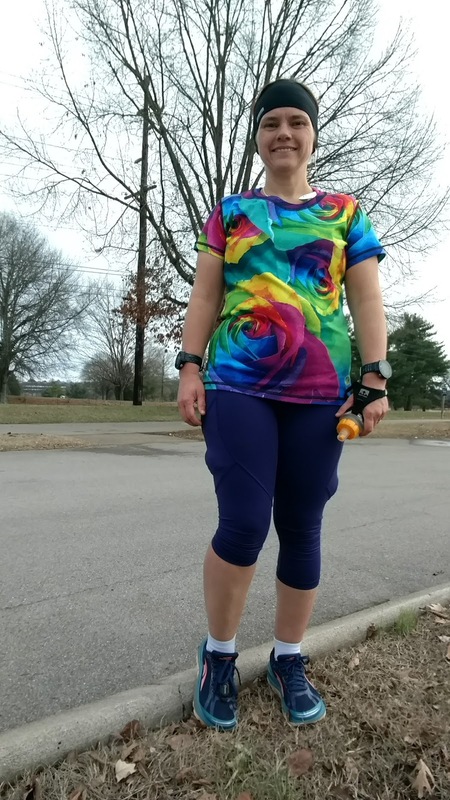 Until I sweated up a bit, the loaded capris wanted to slide off, but I cinched up the drawstring tight enough to catch on my hips so that helped a lot. I can't wait to go run a longer run in these! The only complaint I have is these capris, even in the petite size, are pretty long on me. I would have preferred a little shorter, but I've got a very short inseam, so that's not really anybody's fault. I've only got 2 long runs left before the marathon. The weather is again iffy for tomorrow, so I don't know if I'll be on the treadmill or outside. I'll run 5 or 6 days this week. This week I did the longest run of this training schedule! 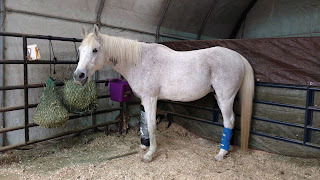 Originally I had signed up for the SwampStomper Trail 25k in West Tennessee, but after my horse re-opened his leg wound in December, I scrapped that since I would need to be gone overnight. I don't remember how many miles I thought I was going to run, but it wasn't 22. But I was feeling good and decided I would go for it. Last marathon training cycle, the longest I did was 20 and it wasn't pretty. I couldn't maintain pace and got slower and slower and slower. That was pretty much the MO for all my long runs last time. I decided to go run Nashville's Stones River Greenway. 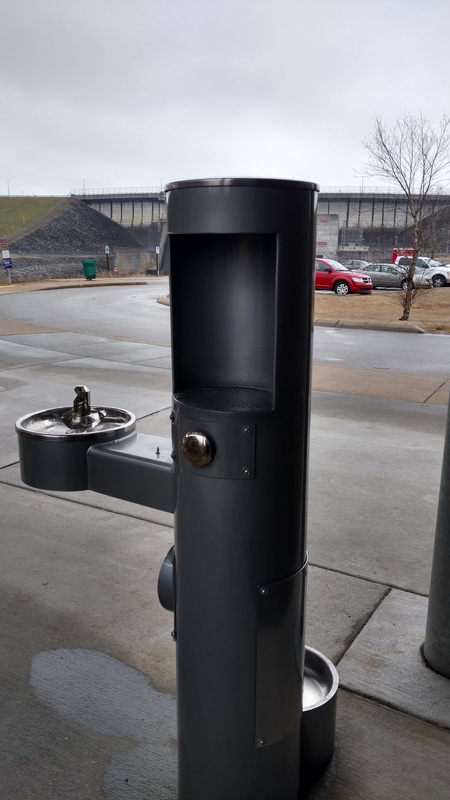 Usually I park at the J. Percy Priest Dam trailhead, but with no water available on the trail during the winter, I devised a different plan. I carried my Mini Sawyer water filter and a 10-oz bottle on my hydration belt and carried my 10-oz Nathan soft flask handheld. I parked at the Wave Country/Skate Park Trailhead parking lot. 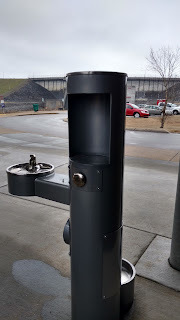 The plan was to run south to J. Percy Priest and stop at the river by the Khols Trailhead to refill my water using my filter, then I could swing back by my truck to refill again before finishing my run. On my drive up there, it rained some, so I chose to wear my Precip jacket in case it did rain. I wore my lululemon outrunner 17" crop pants, a headband for my ears and my rose inknburn tech shirt. I started on my run, but my hands were cold, so I ran back to the truck and grabbed my silk glove liners. Those are easy to stash when I don't need them. It was about 45° and overcast. I usually wear my cushioned Feetured socks for long runs, but I had misplaced one of them when I washed my running clothes and so both weren't clean. So I went with a pair of Balega socks instead. I took another pair of socks and left them in my truck just in case I felt I needed to switch socks mid-run. I have since ordered 2 more pairs of my favorite socks because I really want to wear those on my marathon. I warmed up during the first couple miles as I usually do and opened the pit vents on my jacket. I settled into my run pretty well, with a slower first mile and then a couple slightly faster miles and then settled into a nice rhythm. At mile 5, I passed the Khols Trailhead. I still had about 10 oz of water, so I decided to keep going and not stop. I cruised down to the Dam Trailhead. It felt strange headed there with less than 16 miles behind me! When I reached the bathrooms, I was delighted to see they were finished with construction. The bathrooms were open AND a very nice dog, people, water bottle water fountain was installed and also working! Awesome! I made use of the facilities and refilled my water before starting out again. I spent about 5 minutes there that wasn't added into my average pace time. I headed back. Due to the hills, I flipped back and forth on my miles, doing one mile at marathon pace (13:29ish) and the next closer to a 13:00/mi pace. Finally I hit a long uphill that I walked the entire way. I'm still babying my right hamstring, so I'm not running up many hills. Then I cruised down the other side and to my truck for a faster mile 16. Back at the truck at mile 16 before my break. At my truck, I ditched my rain jacket. It hadn't rained on me once. 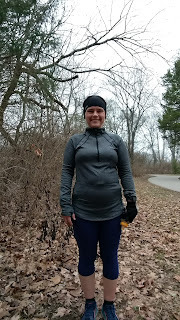 About mile 10 I was a bit warm and had the sleeves pushed up as far as they would go and the zipper down as far as was comfortable without the jacket falling backwards off my shoulders. I also ditched my hydration belt as I had enough pockets and would only need my handheld for the last 6 miles. I didn't feel a problem with my socks, so I didn't bother to change them. I took 6 minutes at the stop that also isn't in my average pace. I was briefly tempted to call it a day, but I still felt good and the weather was fine and it was just another 6 miles. My shirt was wet and I was a little chilly without my jacket, so I kept my gloves with me and wore them for the next couple miles until I warmed up again. I ran across the pedestrian bridge to the Shelby Bottoms Greenway. I turned south along the river toward the nature center. I hit mile 19 before I reached it, but I was close so I kept going until I reached it. I was hoping to find bathrooms and a water fountain there, but I didn't see either. Last push for the last 3 miles. It was harder to start running again after a walking break and harder to maintain pace when I was running, but I managed to do both and in hindsight, 5 out of the last 6 miles were around 13:10-13:00/mi instead of the 13:29/mi target pace. Part of that was just pushing myself to keep moving and some was lack of control. Odd, but true! I was so so glad to stop at 22 miles. That last 1/4 mile seemed very difficult. I forced myself to keep going and not look at my watch, but it was hard. I got to drop to a walk just before climbing up to the pedestrian bridge. 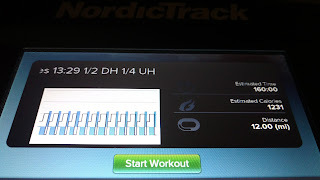 I got cold fairly quickly, so did some light jogging in my cool down to keep me warm in between walking and stretching. This was a hard run for me, but I was so happy to have done it and kept my pace going the entire time. If I add in the 11 minutes I spent at the Dam Trailhead and my truck, my average pace for the run was still 13:44. Which I will take. All done before changing. The bulges on my legs above my knees are my gloves in the weirdly placed "thigh" pockets. I generally ate a gel or 3 shot blocks every 35-40 minutes. At mile 10 and again at mile 20, I ate an entire Picky Bar, which is twice the calories I would normally eat at a time. I really thought I would have trouble eating the Picky Bar at mile 20 and I did a bit, but I was able to help the chewing process with light sips of water. I've been trying to get my eating right as I used to get queasy around mile 12-14 of a run. This time I didn't have a problem until the cool down, but that went away after I ate and drank a little more after getting back to the truck. I tried eating sesame sticks after a run for the first time and that worked pretty well. I had a small blister on my left foot, but other than that, I didn't have any issues with the socks. No guarantee that I wouldn't have gotten that blister with my Feetures socks, but I'm still going with Feetures for my marathon. I was a little sore and this was definitely a beat down on my body. I was on my feet for over 5 hours including warm up, cool down and breaks. Mentally, I'm super glad I did it. I was able to prove that I can keep going. Just another 4.2 miles for the marathon! And I did this 22 miler after a 35 mile week the week before. I'm hoping to feel a lot better before the marathon after a decent taper. 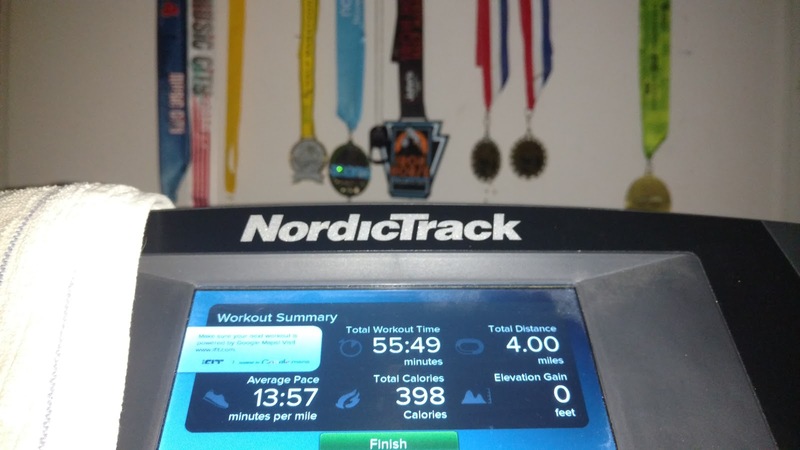 An easy run on the treadmill. No real issues. I stepped back my tempo run mileage from 9 to 6 to compensate for the 22 miler I'd run just a couple days before. Since it was shorter, I decided to do a purposeful negative split, starting at my tempo pace and getting faster with every mile. 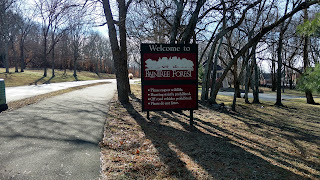 I headed to River Park for a familiar route. It was 45° again. 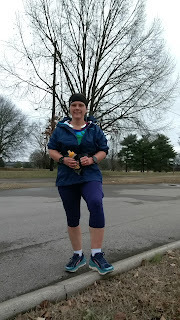 I wore my capris that I wore on my long run, a headband for my ears, silk glove liners and my UA charged wool half zip. I was chilly when running into a breeze. I might have preferred a full hat instead of just the headband. I think I would have been way too cold if I was doing any walking. I hit my negative splits pretty well. Every mile was 5-10 seconds faster than the one before and I did the last mile 23 seconds faster than mile 5. My heart rate was perfectly in line. My breathing was off a few times, but I was able to get it back under control. I carried my Nathan soft flask and didn't have to stop at the restrooms at Primm Park to refill. I had a single gel at mile 1, but I did eat a good meal of grits, cheese and "sausage" before I left the house. I tend to eat that before a tempo run or a long run, regardless of what time of day it is. This was supposed to be a 6 mile run, but I could NOT get my mind around doing 6. So I convinced myself to do 4 instead. 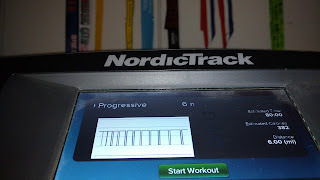 I created a new iFit workout that starts the first run interval at 1/4 mile and walk for 0.05 mile and then, keeping the same run/walk ratio, increases the time running and walking by 10% every interval. The last run interval was over 1/2 mile. It's a good way for me to ease into a workout. My HR was 20 beats higher than it should have been for the first run interval. That's unusual, but it settled for the rest of the run. 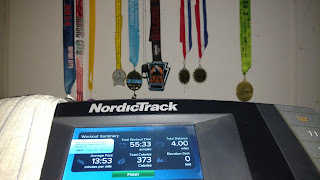 This was supposed to be a 4-run week, but since I wimped out of the 6 miler and doing another 4 would put me at 40 miles for the week, I opted to repeat the same treadmill workout as Thursday. I ran it first thing in the morning before I even did any chores so I wouldn't back out. My HR was normal for this run. Since I ran 5 days this week instead of 4, I might end up running 6 days this coming week, but I've only got 5 on the schedule. No long run this week, just a medium length run. I'm liking this schedule of a long run every other week and a medium length run on the "off" weeks. I'm watching the weather to see if I run outside or on the treadmill. Mentally, this was a really long week! I spent a lot of time on the treadmill and that doesn't really help. 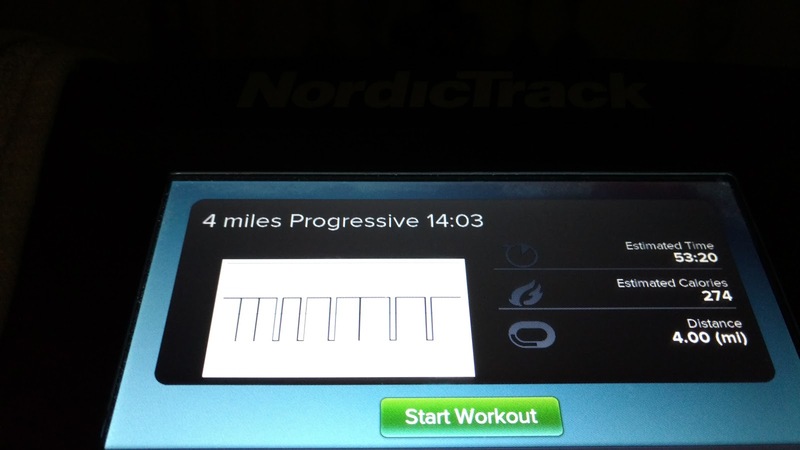 Treadmill console during my run. 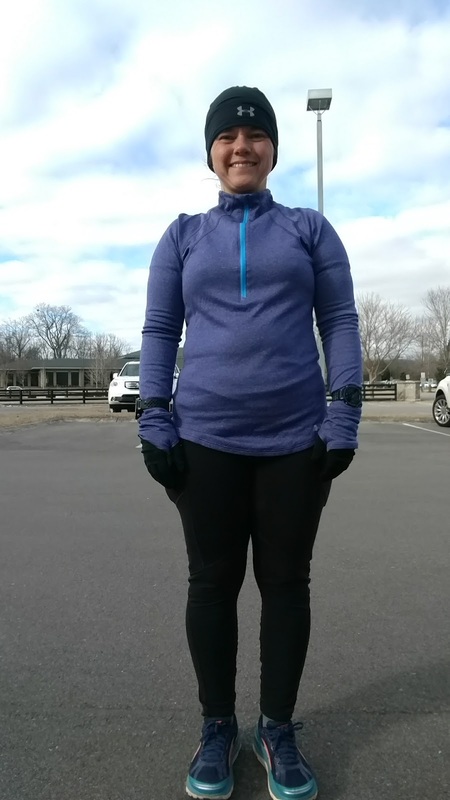 This was supposed to be a long run, not a medium run, but Nashville got about an inch of snow and ice on Friday. We live out a bit and our road doesn't get salted or otherwise attended to until everybody else has. Not only that, but Murfreesboro Greenway was closed. So I just decided to run at home and couldn't face anything more than 12 on the treadmill. I started with a custom iFit program that had me running downhill (-3% incline) for half the time. 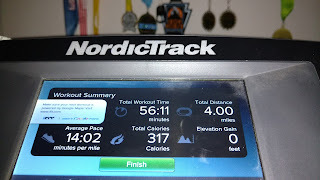 During the actual workout, I amused myself by changing up my pace to run faster down hill and adding incline during the other half of the workout. I still ended up going down hill more than uphill, but it was fine. I watched some tv, but bounced around reading blogs and email and the tv to amuse myself. Never would have thought I could read on the treadmill. 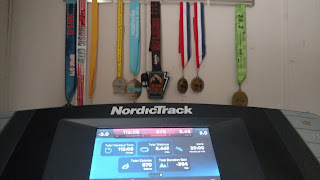 An easy run on the treadmill again. This time I did a custom iFit program that started with a 1/4 mile jog and a short walk, then each run/walk interval got 10% longer until by the end, I was running longer, but also walking longer. 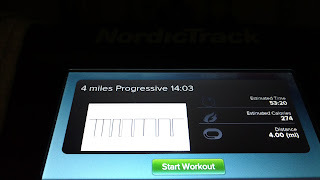 I need to tweak this a little to get it back under a 14:00/mi pace, but it works just fine. This was not a pretty run. It was shorter intervals, running only .22 miles before walking for .03. But it was a struggle for every footfall. I'm not sure why. Likely no fuel on board. I did this over my lunch break after a poor night's sleep and a poor breakfast. I just slogged through it to get it done and was so happy to be done. At least it was only 4 miles. 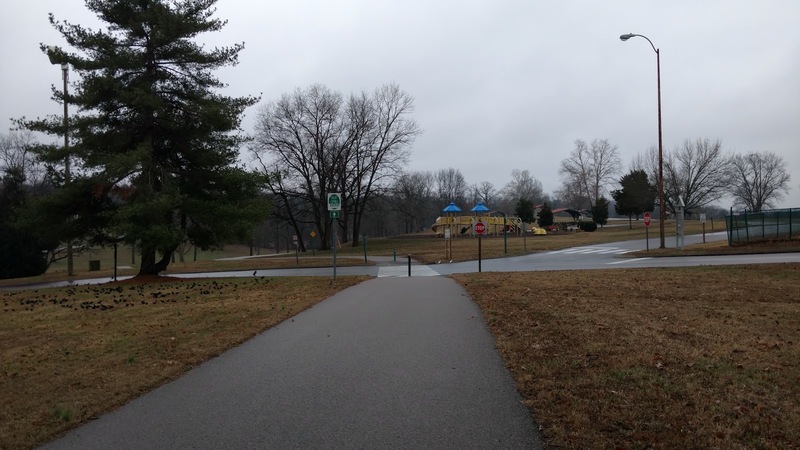 I drove out to River Park and ran to Smith Park and back for my tempo run. This was the only run of the week that had any elevation to it. I don't generally count elevation from the treadmill unless it's significant numbers. This was my tempo/steady pace run. I forgot my handheld water bottle and didn't have a spare one in the truck, so I made do with the rest stops along the trail. I ate 1/2 of a Picky Bar before I left my truck so I could chase it down with water. Then at mile 2.5, I ate a gel right before reaching the first restroom so I could drink out of the sink (the water fountains have been removed for the winter). When I reached Smith Park, I ate another gel and got to drink a good bit out of their freeze-proof fountains. Then I took another gel on the way back at the restroom. This wasn't my normal MO, but the rest stops weren't very far off when I would normally have taken my gels. Since I went inside for each rest stop, I pressed stop on my watch, so the 12:22 average pace doesn't include my stops. Garmin Connect reports my total time, including when I pressed stop and I only spent 3 1/2 minutes at all 3 stops combined. So at least I didn't waste time dallying. Tired me at the end of my run. This was a good run for me but took a bit to get going. It was about 60° with a strong wind for most of my run. I wore shorts and a tech shirt and was a little cold, but it wasn't too bad and it kept me moving. Most of the way to Smith Park, I had a strong cross wind trying to push me off trail. Not sure but what I would have preferred a head wind, at least then I could lean into it! Pleased to have completed this run so well as my second 9 mile run. 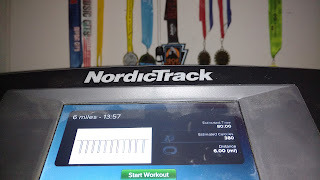 This was a regular easy treadmill run. 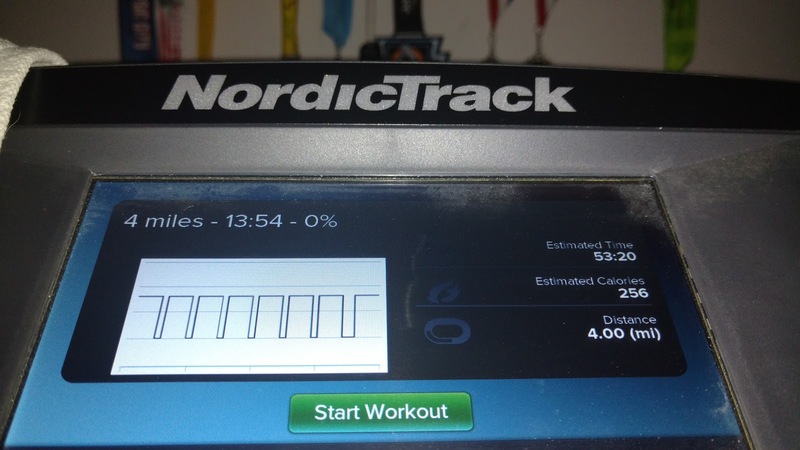 Run for 0.43 miles, walk the balance of the half mile, repeat until done. I was tired and tossed a towel over the console so I couldn't monitor my progress and agonize over every 100th of a mile. My horse, Tanna, in his stall. One reason I'm tired. I was supposed to run 6 days this week and have another 40+ mile week. I had an off-site work meeting at 8 AM and I didn't sleep much the night before, so I didn't run before going to work. By the time I got home, I was so sleepy and tired that I just couldn't face running the hill by my house or running on the treadmill. So I gave myself permission to skip this run. Even though I didn't run 6 days this week, I'm going to go ahead and bump back down to 4 days for the upcoming week. I have an actual long run planned and it looks like the weather will cooperate. I have 5 more weeks of training before my taper. 7 weeks until race day! 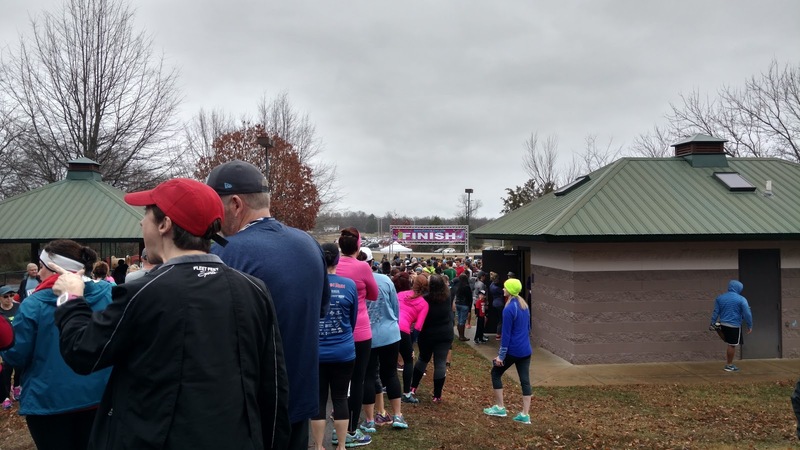 In December, I was looking for a New Year's Day race. 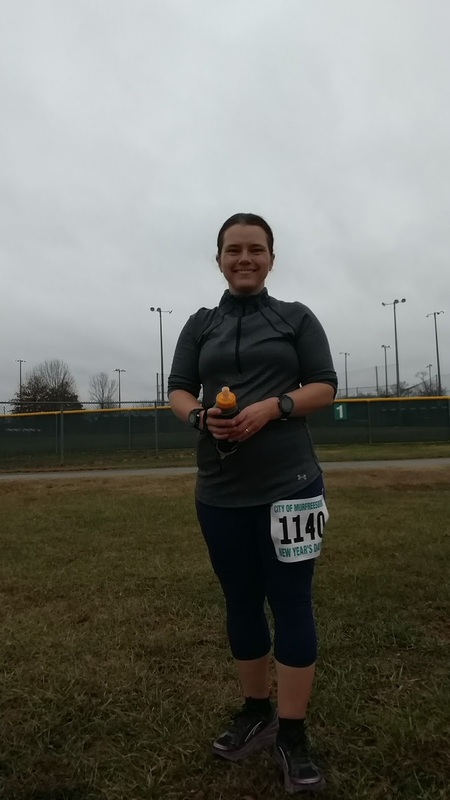 Last year I ran the Iron Horse Half Marathon at Fort Campbell on New Year's Eve and enjoyed that a lot. Since New Year's Eve was on Sabbath this year, I needed something on New Year's Day instead. 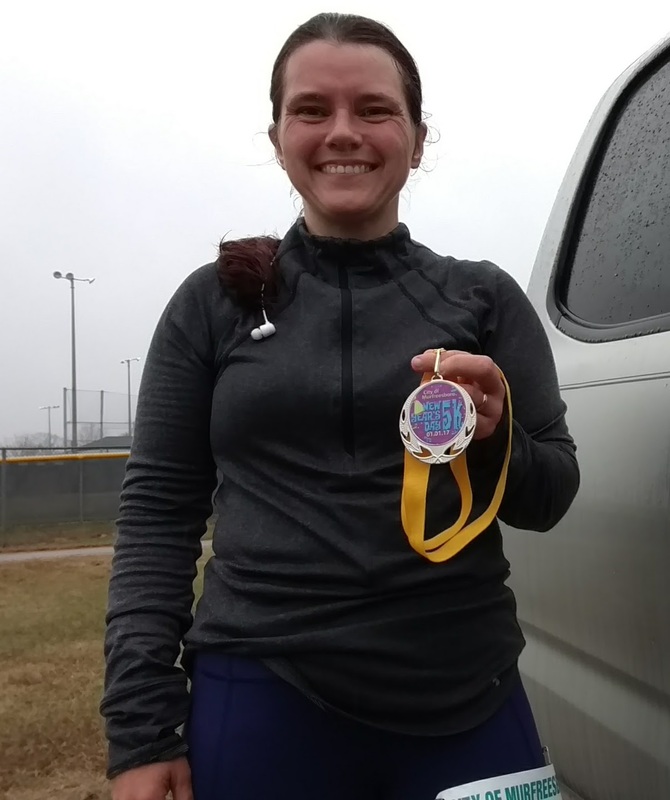 I would have preferred a half or a 10k, but I couldn't find one and this 5k was only 30 minutes from my house and a few minutes from one of my favorite running trails. I thought about running 6 or 8 miles before the 5k, but decided I'd rather try and PR the 5k instead. Also, let's face it, I was being a wimp since it rained all morning, but stopped raining about an hour before the race started. This was an afternoon race, which was kinda awesome since I didn't have to get up super early. The race started at 2 PM. I arrived around 1:20 PM and parked quickly. 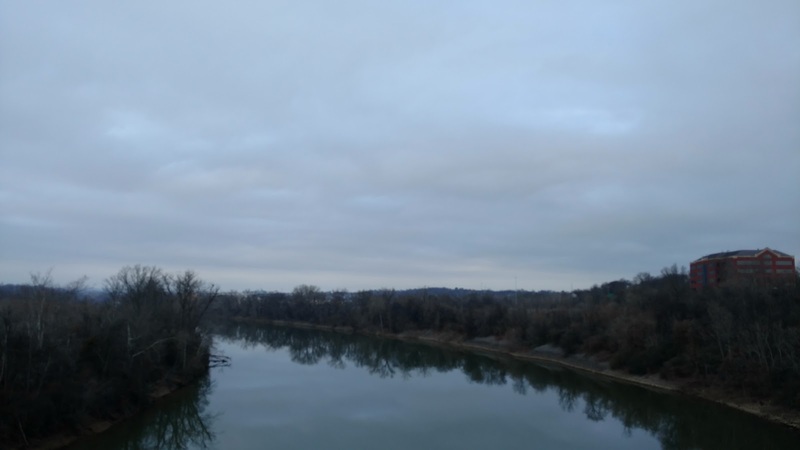 It was still gray and overcast, a typical TN winter day around 50° with a breeze. But at least it had stopped raining! I was wearing my lululemon outrunner 17" crops with the mesh up part of each leg to the knee. These pants have the weirdest thigh pockets. Way too low to be of any use to me, but they have several waistband pockets, one being large enough for my phone (Moto X Pure/Style 2015). I tucked my truck key in another small pocket and a pre-race gel in another. I was also wearing my Under Armor charged wool half zip and a headband that covered my ears. I figured that would be good enough. 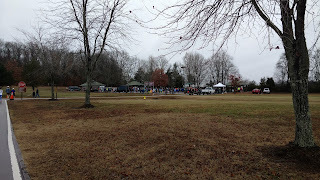 I had plenty of time before the start, so I jogged up to the bathrooms and stretched in the short line. 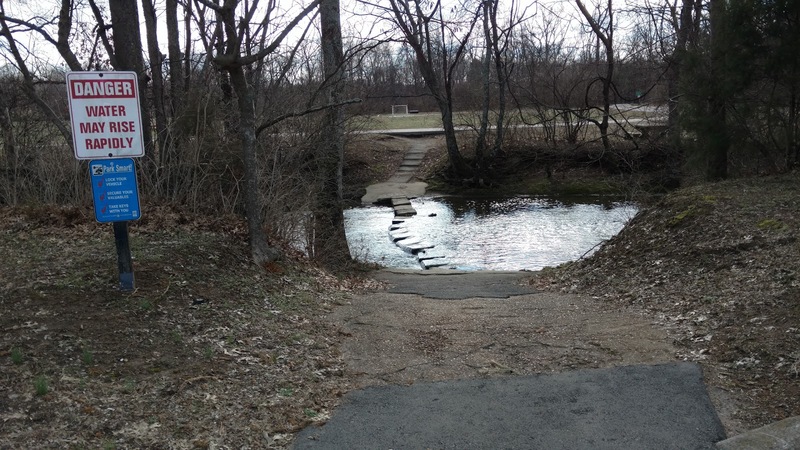 Then I jogged around in the disc golf course for a short distance before I decided I was getting too warm. I pushed up the sleeves of my shirt and ran back to my truck to ditch my headband. I was concerned. I was pretty warm and I didn't have much else to shed. I could unzip my half zip, but that was about it. I was wishing I had a short sleeve shirt to change into. I ran back to the start line and put myself fairly far back in the starting gate. Unfortunately, there were dogs back there even though dogs were not supposed to be allowed in the race. That was annoying. 400 people on a narrow track is bad enough. Add dogs and leashes and it's not very safe. That was my first clue that I should have seeded myself further up. Right as the start pistol went off, it began to rain again and I began to laugh. How funny that it would rain then. I toyed with the idea of pausing at my truck to grab my rain jacket, but decided that was no way to PR a race. Besides, I had been hot during my warm-up. Rain might be just what I needed. I pulled my sleeves down and got going. The first 3/4 of a mile took us around the ball fields. That path was pretty narrow, good for about 3 people abreast comfortably. It was very hard to move around people that were going slower or were walking. 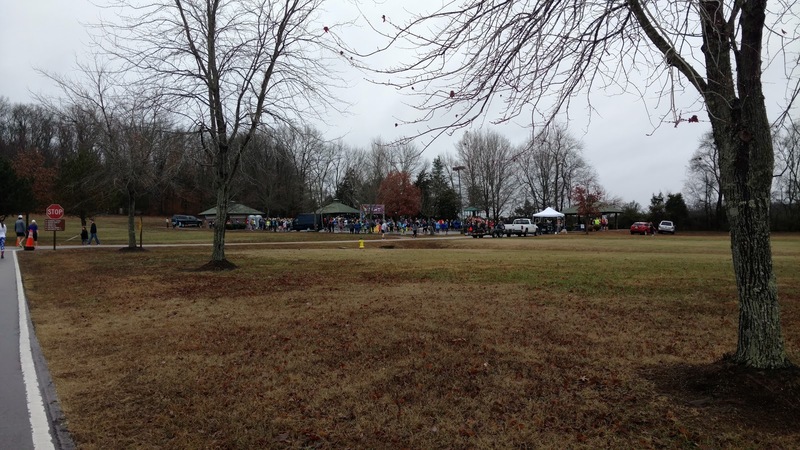 I took advantage of a couple of holes made by other runners and squeezed past a few people. When we got back on the road, things were easier and people began to spread out when we hit the 1 mile mark. Many of the people I'd been running around were dropping back in pace to walk and I finally felt free enough to move out. One thing I should mention. I decided to run this race entirely by feel. I was wearing 2 GPS watches, but one was under my long sleeve and the other was set to only show me my heart rate if I happened to look at it. 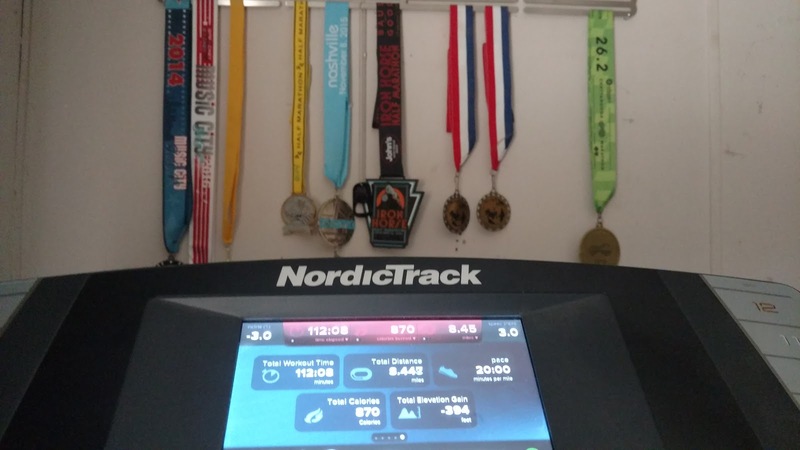 I generally run my races by pace because if I don't, I run too hard and end up with problems for days or weeks after, mostly around my breathing. Because of that, I did still have my watch set to alarm me if my HR got too high. The second mile went on the road by the Wilderness Station and then out to Shelbyville Highway to the turn around. I enjoyed watching the faster runners coming back at me as I passed runner after runner that was walking. After I did the turn around at mile 2, I didn't pass many people as I'd finally found where I probably should have seeded myself in the pack at the start. I was chugging right along, knowing that the last part of this mile had a climb in it. I wasn't sure if I'd walk up that hill or not, but I wanted to make up time where I could. The aid station was just before we passed the Wilderness Station, but I had my handheld and just blew past it. We crossed through the front parking lot at Wilderness Station and onto the Wilderness trail. I ran up a little bit of a hill and down the other side. I was pleased (and a bit smug) that the hill hadn't been that bad. And then...came...the...hill. It really wasn't that bad in the grand scheme of things, but it was steep; just not very long. It felt long at the time. I slowed down, but kept running. A guy blew past me and then I caught him not long after and passed him as he walked. A youngster teenager passed me like I was standing still. I didn't pass anybody else nor was I passed by anybody else the rest of the race. 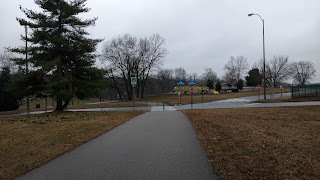 As I crested the hill for the run down to the finish line, a volunteer stood by the side of the trail to caution runners that the pavement was slick. It had been raining the entire run. I was not hot or cold. I had unwittingly dressed perfectly for the race. I thanked her as I ran past and edged off the pavement onto the gravel to run down the hill. l ran through the finish line and had to stop pretty quickly. Having people crowd the finish line bugs me. I like to sprint the finish line to see what I have left or to try to eek out a PR. Stopping short 5 feet after the timing line is annoying. But it seems to be a problem at most races I've been to. Since it was still raining and I had pre-ordered pizza, I ran back to my car before I looked at my watch to see what I'd done. 34:21 on my GPS! 3.16 miles. I had definitely gotten a personal record! 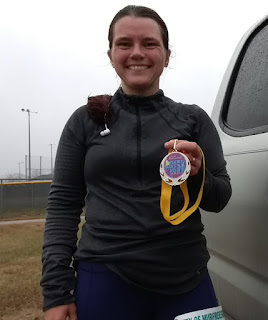 My last PR was in 2014 at 38:41. I was pretty pleased. Going by feel, I had run this race almost perfectly. 11:35 for the first mile, 10:52 for the second and 10:36 for the third and hardest mile. The last 0.16 miles was run at an 8 minute/mile pace. Downhill, though ;-). If I had started a little further up in the starting gate, I might have even broke 34 minutes, but hey, live and learn, I'm still super happy with this run. 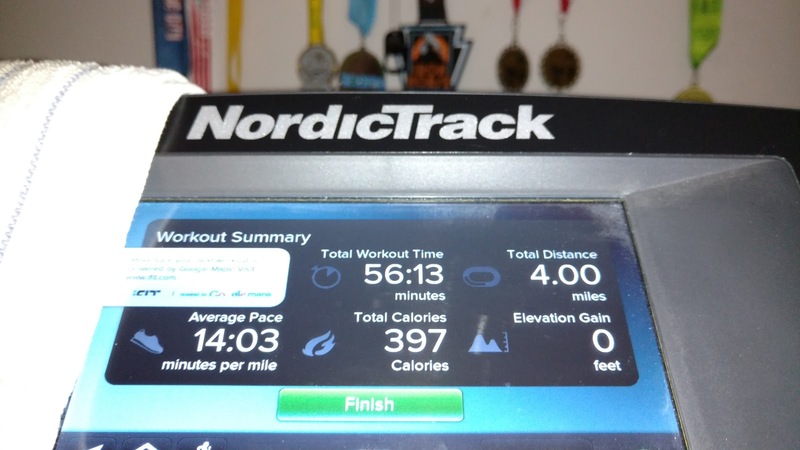 An easy 4 miles on the treadmill. Another easy treadmill run. Normally, this is a tempo/steady pace run day, but I didn't want to do a steady pace run on the treadmill and I needed to stay home to keep an eye on Tanna, my horse that is recovering from a knee injury. I had time to go run my steady pace run. I originally had 8 miles on the schedule, which was a big jump in my mind. 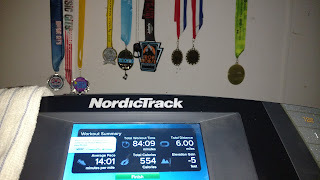 My previous tempo runs have been 6 miles or shorter, but I've done a lot of 6 mile runs, so it was time to bump it up. It was pretty cold on this run. about 35° with a 10 mph wind, but it was sunny. I wore my lululemon Toasty Tech II tights and my UA run true half zip. I also had a headband that covered my ears, a lightweight UA skull cup and glove liners for my hands. I toyed with the idea of wearing my rain jacket as a wind breaker, but decided against it, hoping I would warm up enough to offset the wind. This time I drove to Smith Park and ran the Raintree Parkway to Green Hills Blvd up to Concord Road before I turned around. 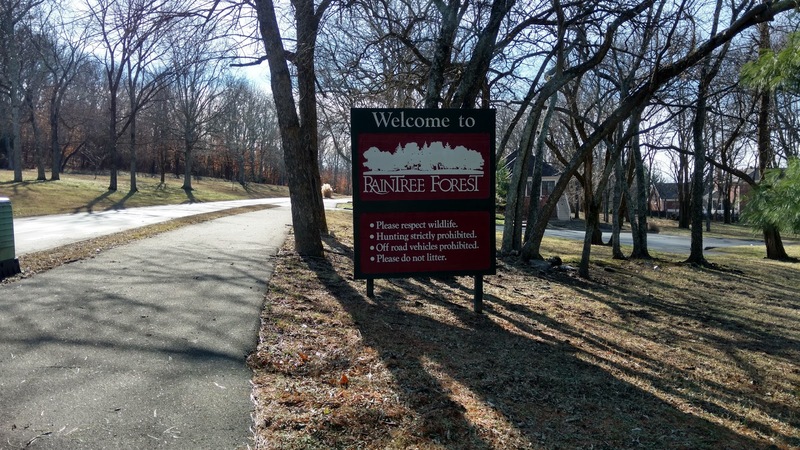 The greenway sidewalk ended with Raintree Parkway, so I ran in the bike lane opposite traffic. There were quite a few hill climbs on this route, good enough to count this as my hill run for the week as well. I was really afraid I'd have to walk the hills on the way back, but I just kept going and managed to do it. I went slow up hill and cruised downhill. I was able to run most of the way, with just one stop to retie my right shoe, a couple of stops for traffic, and once to take a picture. 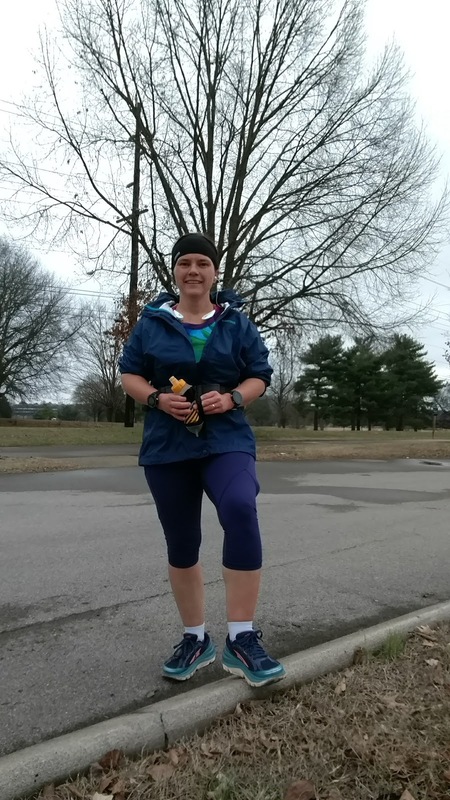 When I got close to the 8 mile mark, I decided to add on an easy paced mile at the finish, but when I got into the last mile, I felt good enough to just keep running. By the time I reached 9 miles, though I was happy enough to quit. I was definitely done. I still had a half mile back to the parking lot. I walked for a bit and stretched, but soon jogged a good bit as I got cold really fast. Most of the run, I was fine. My UA skull cap came off around mile 5, but that was the only change I made. My half zip stayed zipped. So when I got cold when I stopped running, the only thing I could do was put my skull cap back on. Which I did, but it wasn't enough so I jogged to keep warm. 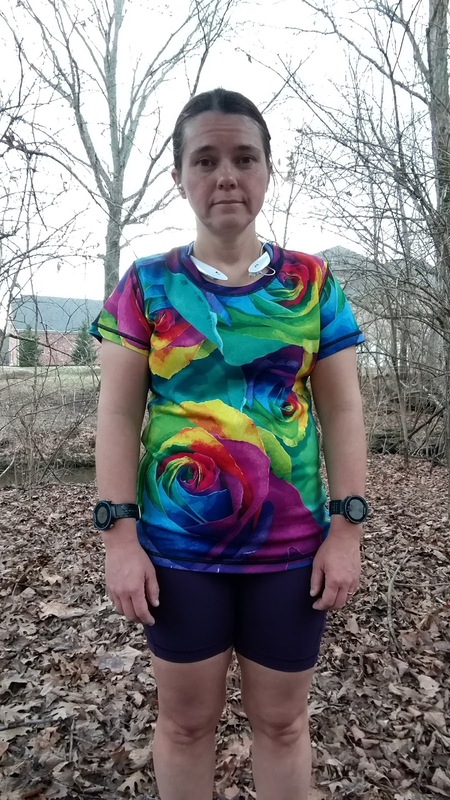 I ended up dressing pretty perfectly for this run, but if this had been a slower paced run/walk run, I'd have been cold. 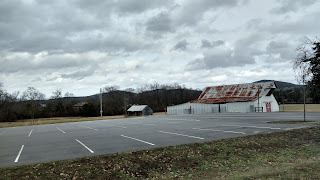 Due to the cold, I didn't linger outside to take any pics at the parking lot and since I was doing a tempo run, no time to take pics on the run except that one I did stop to take. I'm pretty pleased with this run. I ran well, used the terrain well and dressed well. Most of my miles were pretty well in line with my pace goal for the run, being just 5 or 10 seconds off except mile 7 which was 1/2 downhill and 1/2 flat, so came in at 11:36. No need to pull my pace back if my HR is under control and I'm in cruise mode. This was my longest tempo run ever. My last run of the week was on the treadmill again. It was cold and threatening snow, so I stayed at home. This run started with a run of 0.25 miles and then a short walk. Each run/walk interval got progressively longer until I finished the run. Kinda makes it nice to ease into the run. This week is a 6 day run week. So I plan to run every day. 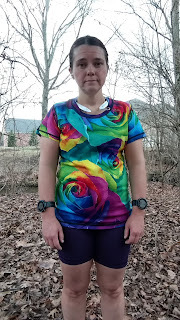 I was supposed to do a long run this week, but our road is still icy and the park trail where I would do my long run is closed, so I'll be on the treadmill for a shorter run. So that's going to make this week shorter in mileage than my plan calls for. Hopefully things will be ok. I'm still training way more for this marathon than I did the last one, so I guess it'll work out all right.